Work or exercise? Both activities are monumentally important, but sometimes we neglect the exercise part. Don't you wish you could do both at the same time? Well, we've got you covered, friend. The WIRK Ride Workstation lets you pedal your way to better health while keeping your productivity high. You can also push the desktop to the forward to convert to a standing desk. The work surface (17.25"W x 10"D) provides a great place to set your laptop or super-secret documents. Or, if tablets are your thing, simply prop it up on the handy-dandy adjustable tablet holder to the angle that works for you. The molded cup holder keeps your drink nice and safe from your occasional clumsiness (or is that just us at Stamina?). The desktop also includes molded handles and a fitness monitor that tracks time, speed, distance, calories, total distance. It even has a scan function so that you don't have to fixate yourself on one stat. The WIRK Ride has its name for a reason. 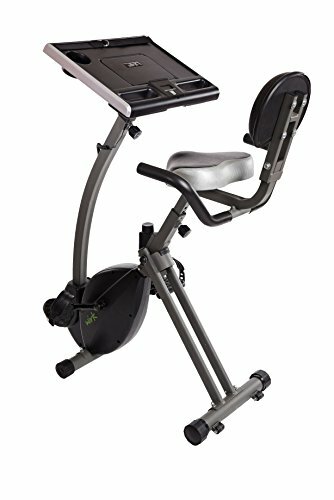 The adjustable magnetic tension exercise bike makes it easy to work your leg muscles and elevate your heart rate. It has a super comfy padded seat and backrest because we actually want you to use it! The seat height is adjustable to fit your ideal pedaling position. It turns out that sitting all day isn't good for you. Even if you are pedaling! So, we've come up with a way to let you use the Ride as a Stand-Up workstation as well. The desktop easily pushes away from the seat by pushing up on the release with your foot and gently pushing away. Then, stand up and get your WIRK on!